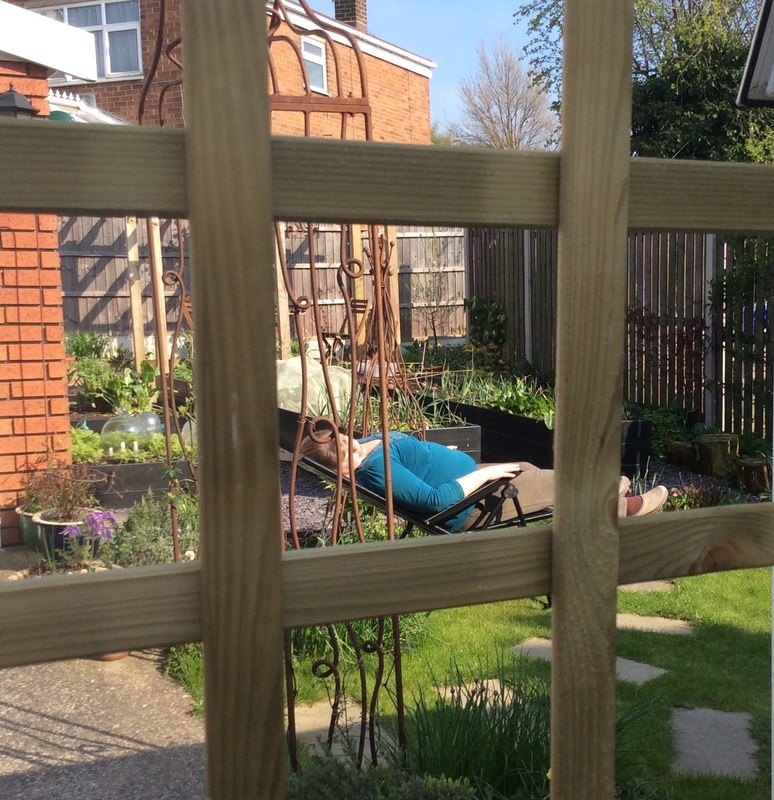 Last October, as I was contemplating the impact weather has on my energy levels, blogger VP, over at Veg Plotting, suggested having somewhere close to the house to sit where I could look at the garden even when I couldn't work in it. That got Kevin and I thinking. The one we had in the conservatory I didn't find comfortable and as a consequence didn't use it. So we moved our comfy Poang chair out of the lounge and into the conservatory. It worked (thanks VP). 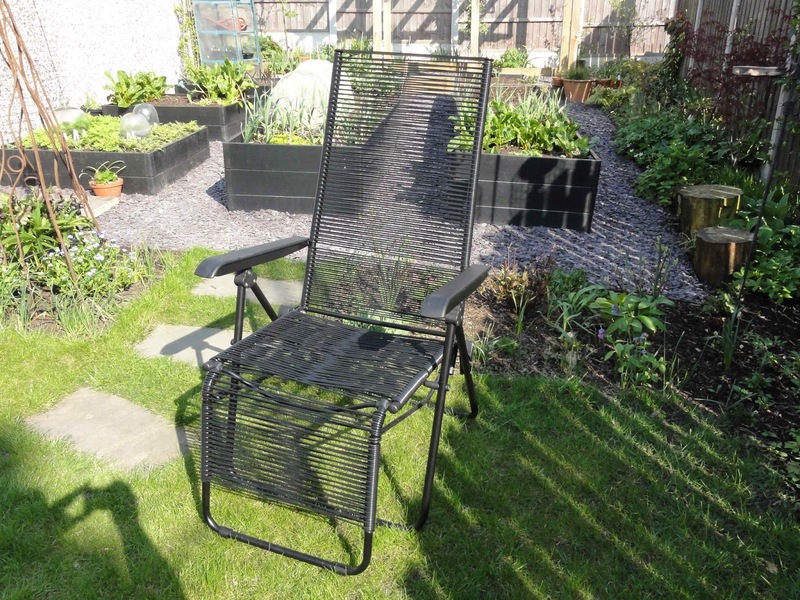 I do use the chair frequently and I do enjoy the garden and the visiting birds and insect wildlife even when I don't have energy to put trowel to soil. It then occurred to me that I need a really comfortable and weather proof chair to sit outside in the warmer weather as well. Something that I could rest in when the weather was good but my ME too bad for me to do any gardening. Also a chair for me to rest in when I was gardening and taking the frequent micro-breaks I needed in order to pace myself. Whilst we had a couple of chairs for sitting on when eating outside, they weren't that comfortable for a proper relax and I found I wasn't using them. Having learnt the importance of having the right chair in the conservatory, I decided it was worth investing in a good chair for outside too. Off to Ikea we went (I know, Ikea, but it's what we can afford) to peruse their many gardening chairs. I was all ready to choose a nice wooden chair, when I saw the one in the photo at the top of this post. I actually tried it out of curiosity, as I didn't think it was that attractive nor did I think it would be that comfortable. Thank goodness for curiosity! It might not look it, but it's incredibly comfortable. And it has about 5 different settings which are easy to adjust whilst you are sitting, or, as you can see in the potato break photo above, lying in it. And because it's so comfortable, I've found it encourages me to take the breaks I need to whilst gardening. I mean, who can resist a lie down in a comfy chair in the sun?! And in a very practical sense, the comfy chair means I am gardening in a more ME-friendly manner, pacing my gardening tasks and rest. It cannot be underestimated, the importance of having the right chair. Now, I suppose I better finish planting those potatoes. I welcome your thoughts and suggestions. And if you blog about gardening with ME/a chronic illness, do link to this post in your blog and leave a comment below with a link to your post, so we can all find each other. Look at you! Looks as if you have made the right choice Julieanne and I think this will make a huge difference to you and your time spent in the garden. 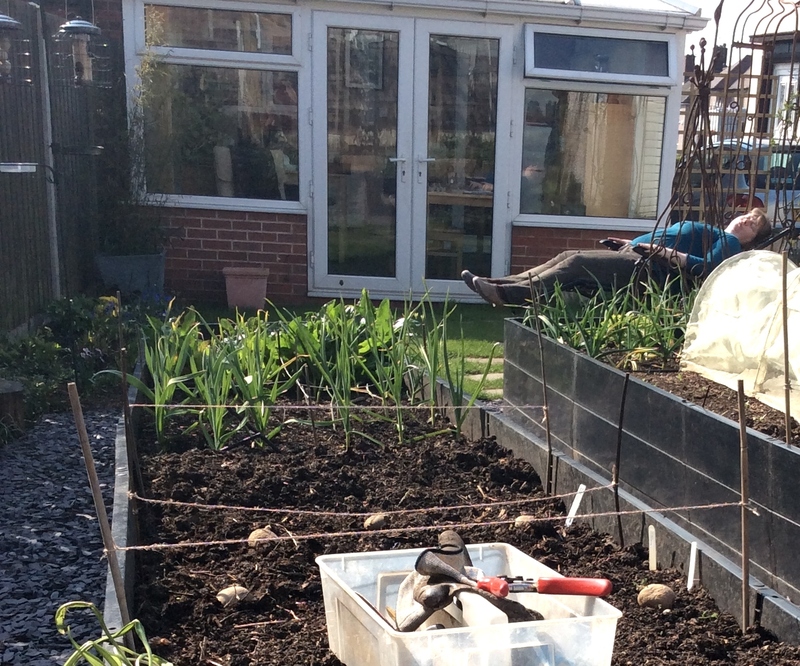 An important part of gardening is taking the time to enjoy what we do. I think your chair is too comfortable! Get back to work! That's a good point Tim, it does add a different stress on the body. The wrong chair just meant I felt like all I should do was just get back to it, rather than properly relaxing. The right chair means I feel more relaxed when I get back to my gardening tasks. You look so comfy in your chair, you obviously made the right choice. Gardening should be a pleasure and not a chore so I'm sure with having lots of short breaks you will be getting lots of pleasure from your garden again. Looks like the perfect chair Julieanne, I learnt the hard way that having a heavy and therefore difficult to move chair is almost as bad as an uncomfortable one, that looks like the perfect balance. Very similar to the ones we bought last year for the same reason, except that on ours the seat is held in place with elastic and it has frayed and snapped, so we are currently chairless again! Best ergonomic kneeling chairs should be not too firm and not to stiff. It's good for health as it engages the core muscles that support proper posture.